Sucheta Dalal :Will Google's ‘Nexus One’ make its debut on 5th January? You are here: Home » What's New » Will Google's ‘Nexus One’ make its debut on 5th January? Will Google's ‘Nexus One’ make its debut on 5th January? Internet search giant Google has sent out an invite for a press conference on 5th January. Google is not saying much about the press conference, except that it would be an Android (Google's open platform mobile operating system) press gathering. However, there have been whispers around the rumour mills that the Internet search giant was planning to throw a press shindig just before the CES, the world's largest consumer technology tradeshow, that will take place between 7th-10th January at Las Vegas. Google will sell its Nexus One smartphone for $529.99 for users who want to use their existing SIM card, or with a two-year T-Mobile contract for $179.99, according to documents leaked to gadget website Gizmodo. Earlier this month, the Wall Street Journal (WSJ) citing people familiar with the developments, had reported that Google has designed a cell phone it plans to sell directly to consumers as soon as next year. 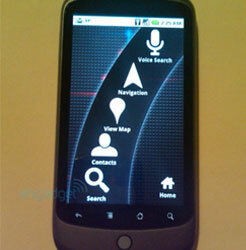 The phone will be called 'Nexus One' and is being manufactured for Google by HTC Corp, the WSJ said, quoting sources. Users will have to buy the cellular service for the device separately. According to TmoNews, T-Mobile has made its expected support of the Google Phone aka Nexus One 'official', albeit in a vague sort of way. Citing sources, TmoNews said, "Through an internal system, T-Mobile is reporting that they are getting an Android device but won’t do any support for it other than 'billing, coverage, features and rate plans’, as we have previously stated. All troubleshooting and exchanges will be managed by Google and HTC. Launch is ‘early January.' That’s all we’re hearing right now but we’re reaching out to sources across the board looking to find out more." Nexus One's launch, especially in the US, assumes significance as T-Mobile and AT&T's exclusivity deals with Apple for its iPhone are about to come to an end. Google's phone would prove to be a shot-in-the-arm for these carriers, who so far had to depend on iPhone for higher-end mobile handsets. The phone runs on a Snapdragon chip, has a super high-resolution organic light emitting diode (OLED) touchscreen, is thinner than the iPhone, has no keyboard, and sports two microphones. The microphone on the back of the phone helps eliminate background noise, and it also has a 'weirdly' large camera for a phone. And if you don’t like the touchscreen keyboard, a voice-to-text feature is supposed to let you dictate emails and notes by speaking directly into the phone, said techcrunch.com, in a report. Google had given the handset to its employees for testing, 'Nexus One' is documented all over the world from every possible angle and with T-Mobile confirming the device, its launch next week may be just a formality.